Minnie mouse never looked better on our pink polka dote tote bag. 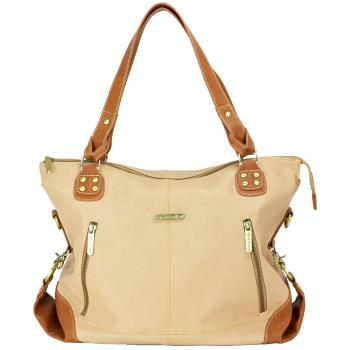 The Kate bag’s upscale sophistication will make you the envy of all the moms on the block! 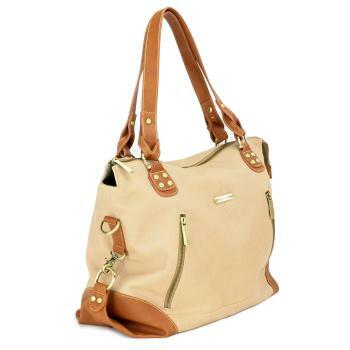 It’s made from easy to clean vegan faux leather (PVC free) and features our custom hardware in an antique brass finish. 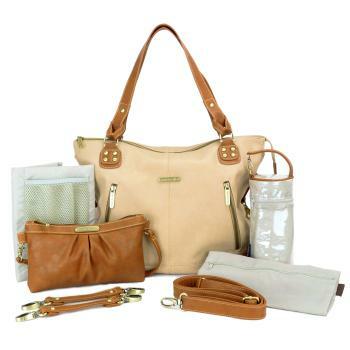 Each Kate comes with 6 fashionable and functional accessories so you never have to sacrifice style for function! The Carter’s Pink Bird Tote is both roomy and stylish at the same time with the black long double handles and exterior pockets, topped with a blue and pink bird print. With a top zip that opens to a roomy main compartment featuring separate storage areas, this Carters Diaper Bag makes traveling with your baby much easier. The Carters Pink Bird Tote includes 9 organizer pockets and coordinating, wipe-able changing pad. It is easy to carry with the comfortable double handles. Carter’s tonal dot tote diaper bag. Top zip opening, spacious main compartment with multiple storage areas. Exterior side and back pockets for added storage. Double top handles for comfortable carrying. Black with pink trim. Diaper changer pad included. Durable. Comfortable. Versatile. Style on the go. The Skip Hop Via Backpack combines great style with lots of function for parents on the go. The perfectly proportioned pack has a pocket for everything ? a unique side zipper means one-handed access and no more digging into a bottomless pit! The easy-access changing station opens up like a book for maximum viewing and includes a cushioned changing pad. Strolled clips that attach perfectly to your stroller are an added plus. Our mickey mouse messenger bag is a great way to combine a classic Disney icon with a highly functional diaper bag. Of course, you need a terrific diaper bag that will live up to all your expectations, and here it is a handsomely sized and styled bag, with so many fabulous features. Fashioned in easy care, wipe clean fabric, this messenger style carrier in deep cocoa brown and spring green will bring a brilliant pop of color to whatever you wear, and, the double, adjustable and padded shoulder strap lets you carry it in comfort. For starters, you’ll find a front placed, flip open, refillable zip case for dispensing those all important wipes, an open side pouch, and a plastic lined, zip close pocket to cleanly and securely stash a bottle, juice box or package of snacks. The back of the bag features a roomy, Velcro close pocket that can effortlessly tote a day’s worth of diapers, and a small zipper compartment, designed to keep your little one’s pacifier clean and always at the ready. The double stitch, color blocked, Velcro close flap features a small, slash style pocket (here’s your handy catch all for keys, credit card or phone) and, just under the flap, a cushioned tablet holder. Zip open the large, fully lined interior to find ample room for several outfits, a sweater, changing pad and blanket. Tablet and cell phone pocket. Insulated bottle holder. Easy wet wipes dispenser. No matter if it’s a walk in the woods or out to the mall, you’ll be hands free and ready to go with your thoughtfully designed Fisher-Price backpack diaper bag. The statement making color combo, shades of gray finished in a beautiful bright green trim, make it a good looking, go with everything carryall, with extra style points given for the silver tone logo pulls throughout. Utilizing the ingenious FastFinder TM pocket system, that helps you find what you need when you need it, it features four, super convenient pockets each designated with an iconic label in contrasting tones, so that the must have item is in your hands in a flash. You’ll come to depend on a lined bottle pocket with elasticized mesh pouch on one side of the bag, and, on the other, an oh so handy wipes dispenser. Two additional side pockets hold a day’s worth of diapers and plenty of room for a change of clothing or three. Up front and right where you need them are a generous open pouch to store phone, keys or tablet, and a convenient zip pocket to keep baby’s pacifier clean and right at your fingertips. A quick to unzip top with double pulls reveals a sizeable interior, beautifully lined in a fresh, light toned, geometric print, so that everything stashed inside is easy to see. An inside pocket holds a nice sized changing pad, making a quick and clean changing station always available. For your comfort, the back is covered in breathable mesh, and the padded, adjustable shoulder straps make for a perfect fit. Insulated bottle pocket. Padded back. Easy wet wipes dispenser. Carter’s tonal dot tote diaper bag. Top zip opening, spacious main compartment with multiple storage areas. Exterior side and back pockets for added storage. Double top handles for comfortable carrying. Black with lime trim. Diaper changer pad included. You and your beautiful new baby will always be ready for that road trip, a stroll through the park, or an outing in the fresh air when you take along our handsome and hard working deluxe sporty diaper backpack. The easy care fabrication and seven total pockets receive the highest marks for a sleek and stylish look and grab and go practicality. Your new, go to bag is stylishly color blocked in shades of gray and bright blue, and features a black mesh rear panel to promote air circulation when you and baby are on the move. Adjustable and well padded straps ensure the bag sits well and comfortably on your back, and the roomy interior can easily tote all the essentials, several changes and much more. It even includes an inside area to securely store your tablet. Four external FastFinder TM pockets stash pacifier, wipes dispenser, diapers and baby’s bottle (in an insulated pouch). In addition, you’ll find a very useful mesh pocket, and two handy zip pouches. For those quick and sanitary changes, your backpack contains a comfy, color coordinated changing pad, and the reinforced footed bottom keep your tote safely off the ground. With your sporty diaper backpack fully stocked and securely on your shoulders, baby can happily share your enjoyment of the great outdoors. Tablet and cell phone pocket. Insulated bottle holder. Easy wet wipes dispenser.